As much as I dislike sitting down and crafting a completed writing product, I love writing to learn. Writing to learn adds to my understanding of content. As a student writing notes was an important part of my ability to do well on tests. I wanted to be a good student and please my teachers. My notes may not make any sense to anyone else but they continue to be an important part of my understanding. As I have gotten older my notes have more scribbles, symbols, arrows, bullets and I use a variety of colored pens. These notes look different but are still very important and when I need to go back and check on something – the color pen I used is usually the first thing that comes to mind. I was the first science teacher in my area to apply and be accepted into the Writing Project. Participating in this project was one of the milestones of my teaching career. The biggest thing it did for me was give me a deeper understanding of the importance of feedback. Feedback needs substance but it can be brief and to the point. A close second was the discovery of Learning Logs and the potential value in the science classroom. The science notebook wasn’t working for me. I wanted students to have access to information over a period of time but the notebook seemed to be just a collection of papers not the important personal information I thought students needed. 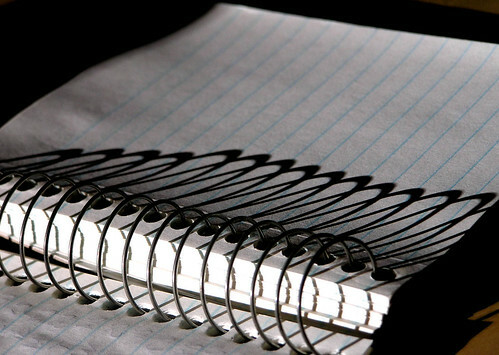 Stenographers’ notebooks and composition books were my Learning Logs of choice and I never decided which was the best. Both have pluses and minuses and I traded back and forth between grading periods and sometimes entire years. Every grading period we started fresh with a new Learning Log and it was a running record of what we accomplished. I liked the permanent line down the middle of each page in the steno book because I could have students respond on one side and then I could respond on the other. I could have students respond to something they were reading by taking notes on one side and asking questions on the other. This Double Entry journaling strategy worked very well but I didn’t have a name for what we were doing until many years later. Students completed their sponge activities; admit/exit slips, data collection, hypothesis formulation, conclusion writing, procedure listing, problem solving, note taking, etc in their learning logs. Pages were never to be torn out and thrown away. Scientists keep notebooks like this. They aren’t necessarily neat and beautiful, they are written with different colored pens, important items are taped and pasted where needed, more than one person’s writing is evident, and they become treasures. Most scientists have a few of these hidden in a safe place. This collection of writing is part of being a scientist. I challenge you to find ways for your students to be scientists and I welcome additional ideas that can help all of us accomplish the possibilities for students. This entry was posted in Blog and tagged Instruction, write2learn. Bookmark the permalink.